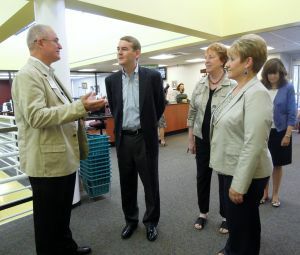 U.S. Sen. Michael Bennet, D-Colorado, stopped by Littleton’s Bemis Public Library on Aug. 6. Bennet and the so-called “Gang of Eight” used the Littleton Immigrant Resource Center, housed in the library, as a model for part of the immigration-reform bill that passed the Senate in June. “This is a great example of how to do it right,” said Bennet. He met with volunteers, students, mentors and lots of people who keep the program ticking. One of those was Ikbal Maardni, a Syrian woman who came to Colorado in 2004. She earned citizenship in 2012 with help from LIRC and still works with its volunteers to improve her English. She enjoyed the library setting so much that she volunteered there for seven years and became a paid employee two years ago. Bennet asked her how she ended up in Littleton. Mayor Debbie Brinkman said LIRC staff has worked very hard to help Maardni and other newcomers feel at home. “Welcoming them and assisting them in their assimilation makes a lot more sense than making them feel isolated,” she said. Bennet’s bill seeks to provide upward of $100 million in federal support for local programs such as LIRC. They’ll be essential to ensuring the success of other aspects of the law, he said, like the requirement to learn English. “You can require it, but if you don’t actually have programs in place to teach English, you’re not going to succeed,” said Bennet. LIRC is currently supported by the city, grants and fundraising efforts by the Littleton Immigration Integration Initiative. “I became concerned that if we didn’t reach out to new people, we could end up as a divided, we/they community,” Susan Thornton, a founder of LI3, told Bennet. Tim Nimz, library director, said such national attention on LIRC is a great boon as it seeks to sustain itself, especially as a service not normally offered by municipalities. “That’s, I think, a real compliment to what’s happening with the program and the priorities of the community,” he said.